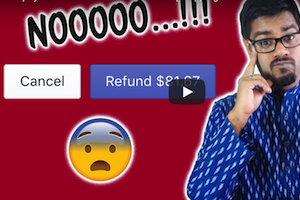 Shopify Refunds: How To Deal With Dropshipping Returns?! So many people regularly ask us about our Shopify Refund Policy. While we’ve touched on this in the past, it has become so widespread that we’ve dedicated another post exclusively to this topic. Because you’re likely dropshipping from China (AliExpress), you can’t really expect your customers to ship the product back to China as it will likely be expensive, not too mention annoying. The concepts we are discussing today are for low to mid-ticket items that have been acquired from a Chinese supplier. For high ticket items, $500 and above it’s recommended that you find US suppliers, which we’ll cover later. So for today, it’s really not complicated. Since beginning our dropshipping business in 2017 we’ve surpassed $100,000 in transactions. With only about $1,000 in refunds. And of those refunds, only a couple turned out to be legitimate customers. The others were fraudulent charges by people who stole credit cards or cancelled PayPal eChecks that never should have been accepted in the first place. We’ve stopped accepting PayPal eChecks altogether, and invite you to promptly do the same. What happens is somebody will pay with eCheck, you then ship the product at which point they cancel the check and you’re out of a product, shipping costs and money. The first thing to do is ask why they want a refund. If the refund request is due to shipping, provide a shipping number and let them know the product is on the way. This usually settles the matter right then an there. Most people just want to know their items are on the way. If the product was defective, it’s important to promptly send a new item free of charge. If they don’t want a new item, ask them to ship the defective item back to you. Within your return policy, be sure to mention that customers pay return shipping. Doing so will result in a happy customer and return buyer. Finally, if they just don’t want the item, provide a return address and ask them to send it back. They of course will be required to pay the return shipping if this is the case. Once they realize they’d be on the hook for the return shipping, most drop it. If you live outside of the United States, Virtual Post Mail gives you a U.S. based address, which will scan and upload content online as well as forward any packages to your home address. You can literally manage your postal mail and package deliveries online from anywhere. That’ll do it for Episode 31 – Great work! P.P.S. Click here for Episode 32! I am not sure I would be happy to be asked to pay return shipping if the product was defective. However it may deter fake detective returns. In the end, it just comes down to making a judgement call based on the customer and their reaction.